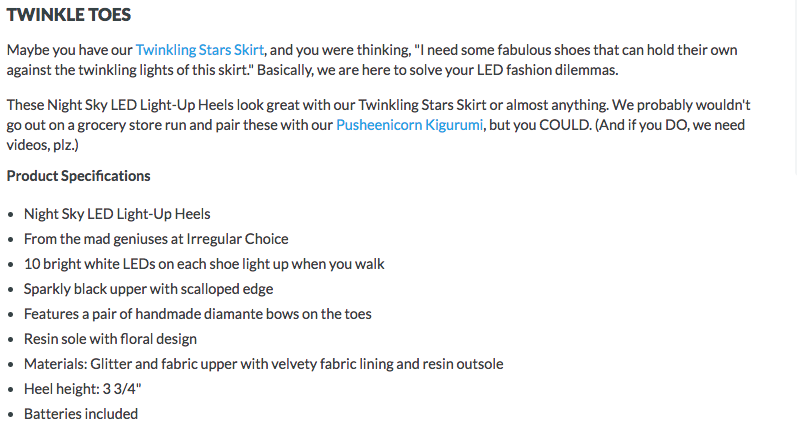 I know, I know, writing product pages is such a bore. You might have hundreds of products, thousands even. And writing compelling product descriptions or optimising each and every page just doesn’t make that much of a difference, right? 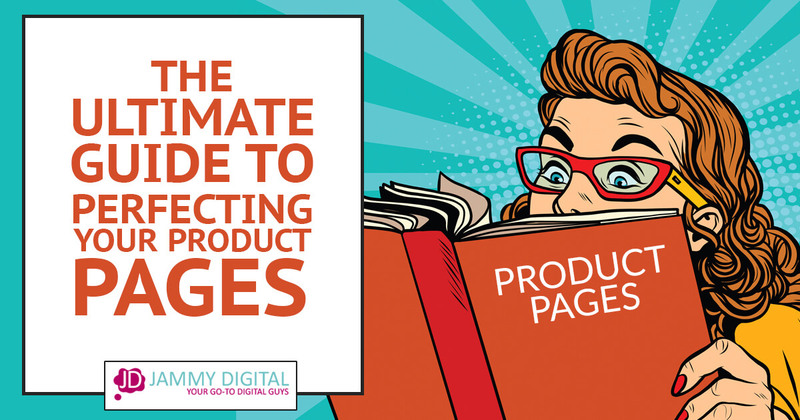 Your product page is the final page your customers look at before they hit that buy now button. When optimised correctly, it’s also a page that can rank highly in Google for certain keywords. I’m amazed by how many business owners put such little emphasis on their product pages, viewing it as an afterthought. But I get it. If you have so many products it’s difficult to keep up the motivation. 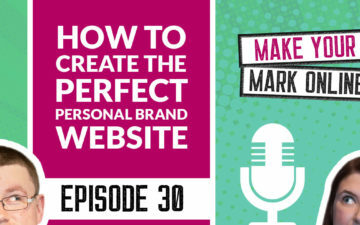 Or you might be unsure how to create a good product page. This post can help. Below, I give you my guide on how to perfect your product page, with examples of how to do it right and how to do it wrong. Get yourself a brew and let’s get started. A million years ago, Martin and I set up an ecommerce site selling gifts. We offered adorable cushions for kids in the shape of owls, monkeys and lions. I gave them product names like Sebastian, Matilda and George. Cute, right? There was just one HUGE problem. No one in their right mind would search for Sebastian when looking for a cushion, so we were never found on search engines. It’s tempting to be creative with product titles. But try to think about what your audience will search for too. Don’t make my mistake by naming your products something completely unrelated to what they are. Chanel has tons of watches with funny names like J12. For them, it’s easier. They can get away with pretension because they’re a well-known, high-end brand, and their customers likely search for ‘chanel watches’ rather than just ‘watches’. You might not have this luxury. Until you’re a huge powerhouse, dial down the pretension and name your products what they are. ‘Luxury Black Watch – J12’. Hugo Boss does a great job with their product descriptions. The product title is a great place to describe the features of your products using keywords consumers might search for. This watch appeared on the first page of Google for the search terms, ‘sliding buckle watch’ and ‘blue plated watch’. Yup. It pains me to say it because the creative in me doesn’t want to concede. But in this case, boring is better for search engine optimisation. It doesn’t mean you can’t be creative at all. Just make sure to include your specific keywords in the title at the same time. The product description is where you can get a little more creative. It’s also a good idea to do a little keyword research before naming your product. Keyword research is the process of looking at the search popularity of certain words and phrases. 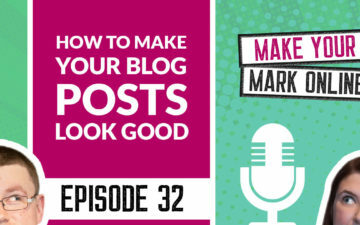 Learn how to check your keywords for free in Martin’s blog post. 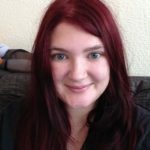 When reading your product description, your audience is asking themselves questions such as: will this product be suitable for me? Is it worth the money? Do I really need it? Your job is to answer those questions so your reader feels comfortable enough investing in your products. It doesn’t matter what you’re selling. Your users need to trust you. 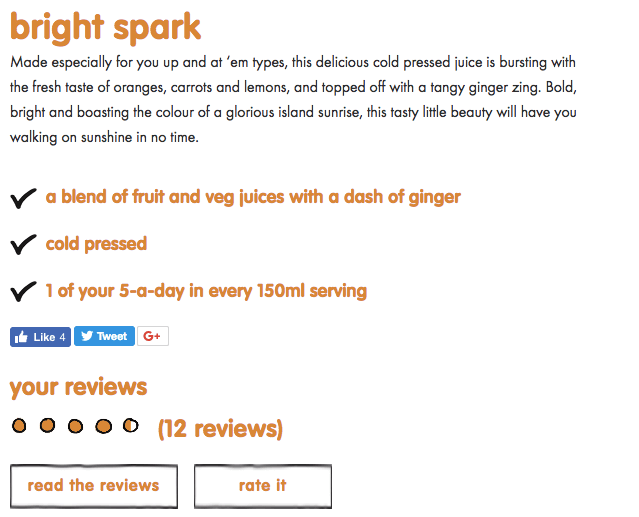 So, how can you build trust through your product description? Identify who your target market is and write specifically to them. Picture your buyer in your mind. How old are they? What do they do for a living? What do they struggle with and what do they hope to achieve? What attributes and hobbies do they have? This exercise helps you build up a ‘buyer’s persona’, and you should use this persona when writing your product descriptions. Talk to your buyer as you would do face-to-face. Don’t just use your buyer’s persona in your product descriptions, use it throughout your content marketing, social media marketing and even in email correspondence. Oh dear, House of Fraser. Is that it? This is a classic example what not to do. What they needed to do is connect with their reader. This is probably the most important shoe purchase of a woman’s life, and they need to sell it much better than this. This is something we see a lot of. It’s amazing how many companies list the features of the product only, and it’s a bad idea. I’m not saying negate the techy stuff. That’s always needed. But place it outside of the product description, under a ‘specifications’ tab, for example. You don’t want to clog up your valuable description space with boring stuff like measurements or materials. An instance where this rule might not apply is if the specification is something your customer really cares about. For example, the engine size of a car, or the amount of RAM on a computer. If it’s something your customers search for, you might consider adding it to the product title too. Think Geek is genius with their product descriptions. I highly recommend you take a look at their website and go through their products for inspiration. Think Geek speak to you as a friend. In this instance, they use humour by suggesting that you wouldn’t want to go grocery shopping in their shoes, but to send them a video if you do. They also use slang to connect with their reader, such as the word ‘plz’. Now, obviously, this wouldn’t work for every company, but it works for their specific market. Your job is to figure out what works for yours. It’s your responsibility to make me care about your product or service. And the best way to do this is by selling the benefits. How will your product benefit your target market? Features are exactly that, they are facts about your product. Benefits tell your potential customers why your product’s features are worth investing in. What you need to do is tell the reader the benefits of your product, and make sure the benefits relate to your target audience. Let’s use the example of an internal locking system on a car. The feature is the internal locking system. The benefit is safety. But when you add your target market to the mix, you might want to think how you convey this benefit. For example, if your target market is busy families, you might say ‘the car features an internal locking system, so you don’t have to worry about the kids popping out while you’re doing 70 on the motorway’. If your target market is single women in their twenties, you might say ‘the car features an internal locking system, so you can feel safe on your journey home after working late’. Meh. Marks and Spencer’s description lacks oomph. There’s nothing that tells you the benefits of the product. You might think, so what? It’s just men’s underwear. The benefits of underwear are pretty obvious, right? Well, as you’ll see from the example below, focusing on the benefits can really help you stand out. BN3TH make men’s boxers. And what could possibly be said about the benefit of boxers? Well, lots apparently, such as the ‘3-dimensional pouch provides for amazing support for your man parts and reduces the need for shifting and adjusting’. Yep. They’ve really sold the benefits of their product. But it works, both for connecting with their audience and differentiating themselves from the competition. You could argue that this would alienate some readers. People may be put off by BN3TH’s description. It’s up to you to weigh up that risk. You don’t want to offend but equally, you can’t appeal to everyone. If you try universal appeal you’ll only come across as boring (exactly like Marks and Spencer). – Give me sensory details! Get your reader to smell, taste and see your product. This is especially important for products like perfumes, bath products, chocolate and drinks. But also, holidays, furniture, gardening products, and things like surfboards or musical instruments. By doing this, you get your reader to visualise what your product will do for them. Try writing down words that describe what your product (or the result of your product) smells, takes, looks, feels and sounds like. Keep writing and you’ll soon have a great list to work from. Hotel Chocolat’s copy fails to get me excited. Their products taste amazing, but I can’t get a sense of anything in the example above. I don’t know what it’ll be like to taste their products (well, I do, but only because I’ve eaten my own body weight in them). But the product description feels like a lost opportunity to really capture their reader. If you’re looking for good product descriptions then look no further than Innocent. This product description wakes you up! Even when you don’t have the image next to it, you still get a real sense of what the product looks and tastes like. It’s memorable, and they use words like tangy, zing, bold and bright to really give you a sense of the flavour. – Don’t Use the Manufacturer’s Description! We see this all the time. If you’re using dropship or a manufacturer that supplies products to other companies, it’s best not to use their product descriptions. This is because other businesses might use the same copy too. Not much of a problem on the face of it, but it runs the risk of being labelled ‘duplicate content’ by Google. If your text is labelled as ‘duplicate content’ then there’s less chance it will be displayed in search results. For example, we found these two product descriptions by two major retailers. It’s amazing how much it happens, and even big companies are guilty! Plus, you can probably do a much better job than the manufacturer because you know your audience. As you can see from the examples above, some of the product descriptions are a little sparse. As a writer, I try to use as few words as possible to make my point. There’s no point having ten words when three will do, right? However, for ranking in search engines, you’ll need a minimum of 300 words. This often means that copy is at odds with SEO. I’d never advise you write for Google, always for your end-user. But if you include all of the points I’ve made above, along with the specifications of the product, you should hit that easily. So what would a product description look like that incorporated all these things? Remember the first bad example I showed you of the wedding shoes? I’ve had a go at rewriting their description to include everything we’ve discussed above. “So you’ve finally found the one. No, we don’t mean your future husband. We mean your dress, of course! And what’s the second most important wedding purchase after the dress? The shoes. The last thing you want on your precious day is achy feet, which is why these shoes are designed for extra comfort. So slide your feet into the soft satin lining and dance the night away in these beauties. It’s easy to miss the importance of your main call to action, but it’s vital you get it right. Your job is to make this button irresistible. It should coax your reader to click it. We put a lot of thought into our client’s call to action buttons. A call to action is essentially a button that gets the reader to take action, and in the case of your product pages, these would be your buy now buttons. Here are our rules for creating the best buy now button. A lot of research has gone into what colour your buy now button should be, but ultimately, you want your colour to stand out. Make it different to what’s already on the page. I’ve seen a lot of companies use transparent buttons, or text with just a border, or simply just text. And although they may be pretty, they don’t pop out to the reader. 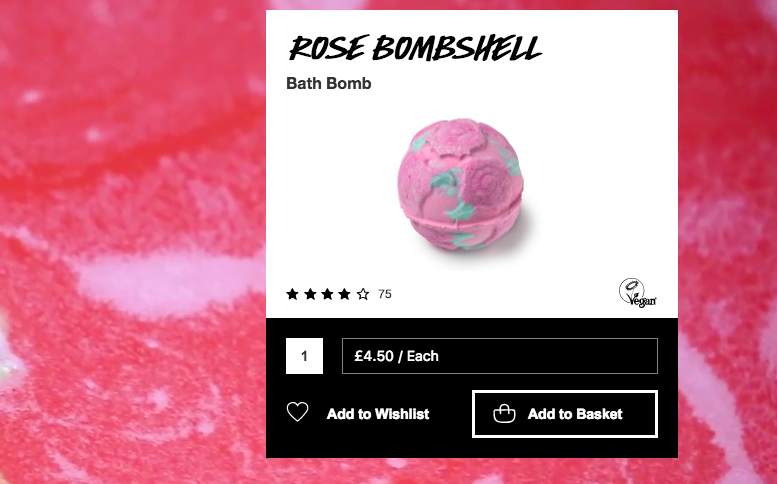 Lush is one of my favourite companies, and yet, my eyes still roam around the page looking for the buy-now-button. From the screenshot, you can’t tell too much, but it’s just not clear enough! If I was them, I’d recommend they test filling their ‘Add to Basket’ button in a different colour. Perhaps all white with black text and icon. Look at this example from ASOS. It’s not exactly the most exciting of product pages but see where your eyes are drawn? Straight to that green button that sticks out like a sore thumb! – Buy Now Button: Above the Fold or Below? Above the fold means everything your user sees without having to scroll down the page. Now, the jury may be out on this one, but I still maintain that buttons above the fold work better. Sometimes, your users only want to scan the basic information before they click to buy. It’s a little more difficult when it comes to complicated products that need to give the reader a more in-depth description and understanding. But I still think that a buy now button should go above the fold, mainly because users expect it to be there. Ah! Not on the High Street, so pretty, right? Yes, it is. But that doesn’t mean it can’t be improved. I often click the favourite button thinking it’s the add to basket button. Amazon’s product pages aren’t pretty. But they work. They keep their ‘add to basket’ button way above the fold, even on long-winded product descriptions. It’s a good idea to let your button breathe a little, away from the product description and image so it doesn’t get lost. It sounds obvious, but a lot of companies get this wrong. Next’s Add to Bag button kind of gets lost because they’re also trying to promote their store card. Save it for the next page, Next! Leave the space around your button clear. Staples do a great job of this. The button is to the side with plenty of white space around it, plus the colour just makes it clickable. What you’ll notice from these examples is that it’s not necessarily the prettiest websites that get it right. Sometimes there’s a battle between what looks good and what increases conversion. I’m not saying make your buy now button ugly. But make it stand out. Your job is to find the balance between what looks good and what attracts attention. Product photos are one of the most important elements of a product page. If you’re anything like me, you’ll head straight to the images first. It’s vital that your product images are of good quality. There are two kinds of product photo; isolated images on a clear background, and ‘lifestyle’’ photographs such as an image in the garden. You’ll know what kind of photographs are best for you to use. I’d recommend, where you can, using a combination of both styles so your users can see it close up, but also in action. If you’re taking the photographs yourself, check out this post from Shopify which shows you how to do it and what tools you might need. Once you’ve got your photographs nailed down, it’s time to get them on your website, and trust me, your hard work hasn’t finished yet. Search engines can’t see your images, but they can read ALT text and what your images are called. To maximise your chances of getting seen in search results, you need to optimise your images correctly. But what does that tell Google? Absolutely nothing. Separate your words using a hyphen (-) – not an underscore! 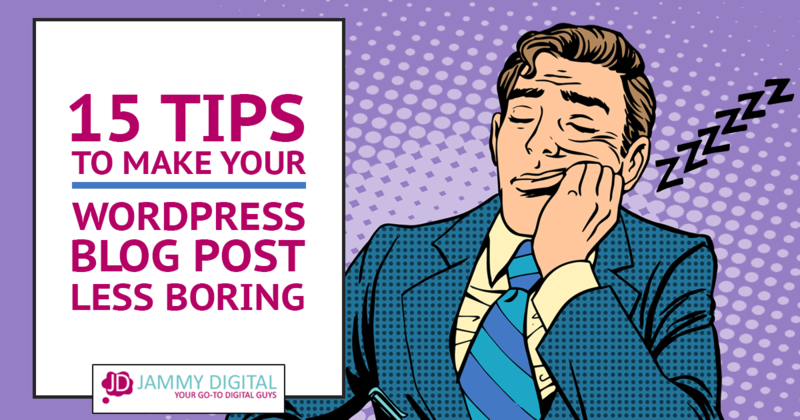 Make sure your images are a minimum of 800×800 pixels, so when someone clicks on the thumbnail of your image they can view the image much larger. The biggest mistake people make when it comes to images is resizing the image in the backend of the site. This should be done BEFORE it’s uploaded the website. An iPhone picture might be 1.5mb, and 3000×4000 pixels. Triple the size of what you actually need. If you continue to do this, your website will run slow and sluggish. You’ll run the risk of irritating your end-user and getting punished by Google. Ouch. So, before you upload your image to your content management system, use a website like PicResize to reduce the size of your images without losing the quality. When you’ve uploaded your images to your website, it’s a good idea to give it some ALT Text. ALT Text, which stands for alternative text, is a phrase or sentence that describes your image. You’ll be given the option to fill this in when you upload your image to the backend of your site. ALT text is what Google uses to rank your image in their image search results (the image tab on the search engine). A lot of people make the mistake of thinking that their customers will land on their homepage directly from Google. But with ecommerce websites, you’ll often find that people access your site via your product pages first. This is because they’re searching for the product you’re selling. Your job is to increase your chances of getting your product pages to appear higher in search results. Well, we’ve already covered the product title, image file names, image size and ALT text. But below, I’ve highlighted some further ways to optimise your pages. Every good content management system or shopping cart will allow you to edit these elements of your product pages. Consider what your customers will search for when looking for your product and include these in your title tag. But do it naturally. When you read it does it sound spammy? If you’ve stuffed a bunch of keywords in so it doesn’t make sense then Google may punish you. Don’t do it. An example of this would be: Red dresses, dresses that are red, red dress. Eugh. 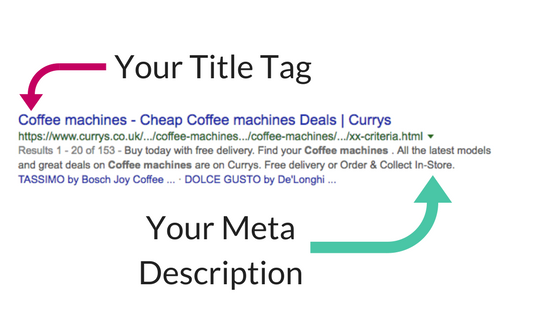 Typically, Google will display 50-60 characters of your title tag. Make sure you keep within the 60 character limit, that way it won’t get cut off partway through. If you’ve got a lot of products it can be tiring assigning a title tag to each and every one. Here is an example of a formula you could follow to help you. We often use this symbol |, called a pipe to separate phrases just because it looks more attractive. You could also use a hyphen if you wanted too. Google increased its limit for meta descriptions in December 2017. Technically, meta descriptions should be less than 300 characters, but it’s best to keep it below 200. Shorter and sweeter is far more beneficial for your end-user. Your meta description should talk to your reader. It is not an opportunity for you to stuff every keyword known to man in there. It should be in sentence form and flow naturally. I get it. If you have thousands of products, this can look like a daunting task. But try to come up with formulas you can stick too. Make sure you do it on products going forward and fill in the backlog as you go. It’s not a fun task, but it’s worth it. What I’ve covered so far is everything that makes a good product page. Below, I’ll go into further details on how you can add more oomph to your product pages. These are just examples and you certainly don’t need them all! Social proof is a way of showing your audience that other people have benefited from your product. Common forms of social proof are customer reviews or testimonials. Including social proof on your product pages can help make a sale. It can give your user that little push (or hard shove) to click that buy now button. Below, I’m going to outline ways you can incorporate social proof into your product pages. This is where customers give your product a rating. It’s usually between one and five stars and they’ll also be asked to volunteer a review. If you want to get super helpful, ask your customers to rate you out of five for specific things such as value for money, delivery, quality, appearance, etc. You could get no reviews, which makes your site look like a wasteland! I recommend using customer reviews when you plan on shifting a lot of products. Far too often, I see websites with no reviews and it looks like no one is buying! A good tip for gaining customer reviews is to send your customer an email after their purchase requesting they leave a review on your site. Kidly do a great job of featuring a customer testimonial in the form of a ‘parent test’ section on each product page. A featured testimonial allows you to have more control than you’d have with customer reviews. These testimonials allow you to ask your customer specific questions, giving you the opportunity to shape a really good review. To me, the benefits of featuring customer testimonials on each product page far outweigh the headache of actually doing them! Giving your thoughts about what you love about your products can be a great way of connecting with potential buyers. This is especially true if you have a lot in common with your target audience, i.e. your target audience is essentially you! For example, if you’re a mum who sells kids’ clothing, you can talk about how your products have benefited you and how much your children love them. This adds social proof but also gets your reader to connect with you on a personal level. They’ll feel like they’re buying from you and not just your logo. Even if you decide to use customer reviews or testimonials, there’s still no harm in adding your own thoughts as to why you love your products. I’m on the fence whether this is technically classed as social proof, but I do think it would be beneficial. Good press and awards are a great way to show social proof. Even just an ‘As featured in…’ with links to said organisations, are enough to show your potential customers your products will benefit them. But have you considered gaining reviews and opinion pieces about your products outside of mainstream media, such as BBC/Guardian/Daily Mail etc? Research bloggers and key influencers in your area and see if they’re willing to do a review of your product. The above might appear daunting, but try to feature at least one on your product pages. It might be tempting to try to cover all four but you can always test out others later. If you already have reviews on your website but you’re only getting very few or none at all, try adding your views of the product as well. As well as having images why not use video too? This is becoming increasingly common. People have different preferences as to how they want to consume content. Some (like me) prefer reading, others (like Martin) prefer video. To maximise sales, it’s a great idea to include both platforms. Depending on your content management system, you can add video to the same place you add images. Or you could add it to your product descriptions. Have a play about with it and see works best. You can use video to describe everything you’ve included in your product description. The only difference is the platform you’re using to communicate. You often see this with things like washing machines or coffee makers, but you can pretty much use it with anything. I’ve linked to an example of this from Currys here. It’s often hard to visualise a product using only images. That’s why you find a lot of clothing/shoe companies showcase their products in video. Your audience gets a sense of what your product would look like on the move. I’ve linked to an example of this from ASOS here. Often consumers can be put off by installation and setup. If you can show your readers how easy it is to set-up your product by walking them through the steps then you’re onto a winner! Not a lot of companies do this, which is a surprise because I think it would really help push sales. By including related products at the bottom of your product page, you will encourage your end-user to explore your site and products further. Some people worry this takes your user away from their purchase, but if they do want to buy they will find their way back. This is about you presenting them with all the buying options, which can only be a good thing. What you can achieve is really dependant on how advanced your content management system/shopping cart facility is. But most good content management systems will at least give you the option of including the related items. You can usually add related items by using your product category tags. This is by far the most popular version. I know there’s a lot to think about. I’ve also designed this as an easy-to-follow checklist that you can use when creating your product pages. Eventually, this will become second nature, but this will help in the meantime. You certainly don’t have to include everything, particularly of the social proof and featured products sections, otherwise, your product pages might become huge! If you have thousands of products, please don’t worry! Just start slow and incorporate some of what I’ve talked about going forward with any new products. You can always backfill at your own time and pace. Amazing! Bookmarked. I know a lot of research went into this and the examples are so helpful.